Defined by the scorched appearance of geysers, hot springs, and a fragile crust, the Norris Geyser Basin is the most active geyser area of Yellowstone National Park.Providing the clearest pictures of Yellowstone’s volcanic upbringings, Norris is an otherworldly environment filled with colorful thermophiles, hissing steam, and three miles of boardwalk to explore it all. One of the area’s largest features, Steamboat Geyser, is the world’s tallest active geyser and has the capability to shoot water 300 feet into the air. 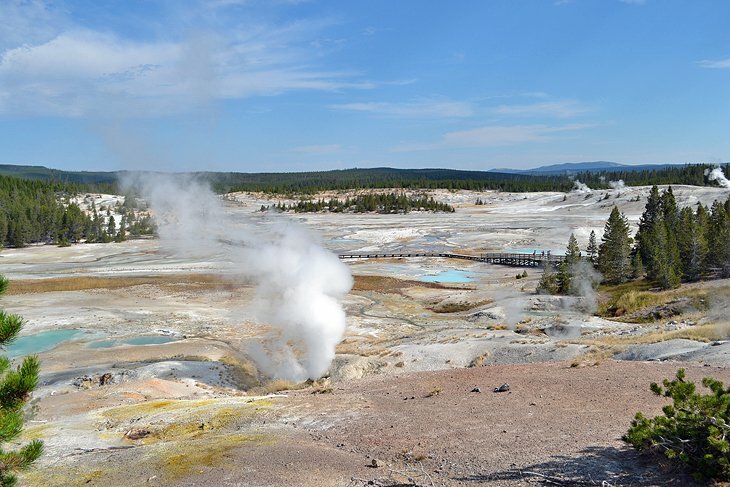 Split between a Back Basin and Porcelain Basin, there’s plenty to explore at the dynamic Norris Geyser Basin, including the Historic Norris Museum, all reinforcing its status as one of the top attractions of Yellowstone.